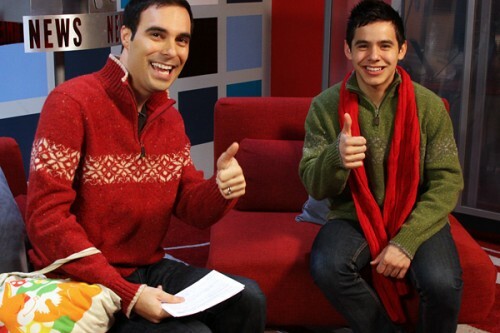 David Archuleta is spreading the Christmas spirit in his imitable style. Today he and Jim Cantiello of MTV News wore coordinated holiday sweaters. And look what David has Cantiello doing: Yep! It’s the thumbs up sign. Look! @DavidArchie & I [sic] in our coordinating Xmas sweaters. Also, why is this the least flattering picture of me ever? This is an awesome photo and David’s such a true spirit to spread the positive word with his winning smile and gesture towards Heaven. It makes me smile big-time. Thanks for posting.